This traditional type rowing boat with shoal draft flat bottom and rounded topsides has long been popular in Europe and the U.S.A. The design makes an interesting project for the amateur builder as the construction method is not difficult. The sides can be planked in either lapstrake (planks overlap) or carvel ( planks butted along their edges). Solid lumber or plywood can be used for the planks. Also can be cold molded. The 14' Rowing Dory on this page was built by Pavlo-Bini-Brazil. Plans complete with instructions and full-size patterns for the frames and transom. The Dory 14 is a row boat, but the plans show an alternative transom for an outboard up to 5 hp. 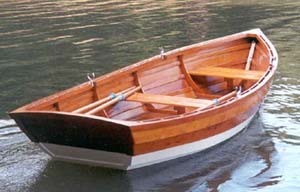 A lapstrake boat, where the planks overlap, the version shown in the picture, can't be successfully fiberglassed over the edges of the planks. However, the bottom up to the edge of the first plank can be fiberglassed. The planks above the first plank can then be coated with Epoxy-Plus without fiberglass cloth. The Epoxy-Plus Fiberglass Covering Kit for this model allows for covering the bottom up to the first plank and coating the remaining planks with Epoxy-Plus only.